With the implementation of tariffs taking effect, President Donald Trump’s trade policy has roiled commodity markets. Tariffs have been imposed on U.S. imports, triggering counter-tariffs on U.S. exports with ag commodities a common target (see farmdoc daily April 17, 2018 for example). Existing trade agreements, notably NAFTA, have also been reopened. These events bring to mind the partial embargo of U.S. ag exports to the Soviet Union imposed on January 4, 1980 by President Jimmy Carter in response to the Soviet Union’s invasion of Afghanistan. It was lifted by President Ronald Reagan on April 24, 1981. This article examines U.S. exports of corn, soybeans, and wheat in long term perspective with a focus on the USSR grain embargo period. Its focus is U.S. exports to the world, not just to the USSR. Quantity of U.S. corn, soybean, and wheat exports were little impacted during the years of the USSR grain embargo, but declined in the years that followed. Moreover, U.S. corn and wheat exports have never really exceeded the quantity they reached in the early 1980s. The USSR grain embargo of 1980 was a partial, not total embargo on a wide range of agricultural products, including grains, oilseeds, as well as meat and livestock products. Sales to the USSR remained large as previous trade commitments were honored. It is also important to note that it was the 4th U.S. embargo or moratorium on exports since 1973. The first was a ban on all exports of soybeans, cottonseed, and their products during the summer of 1973 in response to very high soybean prices and concern about domestic U.S. supplies. The second and third were U.S. moratoria on export sales to the USSR in 1974 and to the USSR and Poland in 1975 as a response to the U.S. drought of 1974 and USSR drought of 1975. While the USSR embargo of 1980 has garnered the most attention over time, it is more likely that 4 embargos / moratoria in a span of 7 years had a cumulative effect that exceeded their individual effect. For an extensive and excellent discussion of these embargos and moratoria, with a focus on the 1980 embargo, see the U.S. Department of Agriculture (USDA), Economic Research Service (ERS) report published in November 1986. The data used in this study are U.S. and world exports of corn, soybeans, and wheat measured in million metric tons (MMTs). Source is “PSD online” (USDA, Foreign Agriculture Service). The analysis starts with the 1964/65 (1964) crop year, the first year data are reported for soybeans. Quantity of U.S. exports of corn, soybeans and wheat rose by 373%, 67%, and 104%, respectively, from 1970 to 1980 (see Figure 1). Corn exports have never really exceeded the 61 MMTs exported during the 1979 crop year, although exports were slightly larger in 2007 at 62 MMTs. Wheat exports peaked at 48 MMTs in 1981, a level never approached since. Next highest year was 1987 at 43 MMTs. Soybean exports did not consistently exceed their late 1970/early 1980 level until the late 1990s. Peak exports are 59 MMTs in 2016. In contrast to the U.S., exports of wheat by the rest-of-the-world (ROW) increased consistently after 1980 (see Figure 2). ROW soybean exports remained stable from 1980 through 1985, then began to increase consistently. The rate of increase accelerated after 1995 with China’s emergence as a major importer. ROW corn exports were erratic around their 1980 level until 1990, then began to increase. Interestingly, ROW corn and soybean export quantity have tracked one another since the mid-1990s. U.S. share of world corn and wheat exports rose during the 1970s (see Figure 3). U.S. soybean share began to decline after 1976 as South America emerged as an exporter. Since 1980, U.S. soybean and wheat share has declined fairly consistently at annual rates of -1.3 and -0.7 percentage points, respectively. Corn’s share declined erratically at a rate of -0.3 percentage point per year between 1980 and 2000. Decline has since accelerated to -2.2 percentage points per year, with decline particularly large from 2007 to 2011. 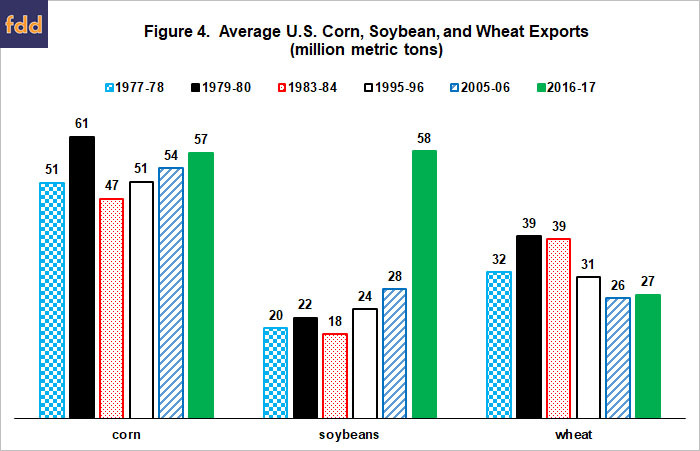 U.S. corn, soybean, and wheat exports were, respectively, 20%, 11%, and 25% higher in 1979-80 than in 1977-78 (see Figure 4). Wheat exports were the same in 1983-84 as 1979-80, but 1983-84 U.S. corn and soybean exports were less than in 1979-80 and even 1977-78. Corn and wheat exports in the pairs of years after 1984 were lower than in 1979-80. Soybean exports were higher, but only markedly so in 2016-17. The pairs of years, in chronological order, precede the embargo; cover the embargo years, immediately precede the 1985 farm bill’s substantial reduction in U.S. prices to stimulate demand, and then at roughly 10 year intervals. 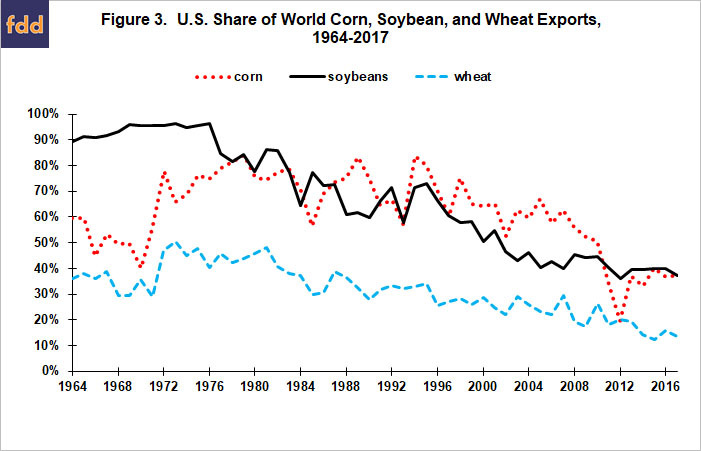 As with quantity of U.S. soybean and wheat exports, U.S. share of world exports for these crops was higher in 1979-80 than 1977-78 (see Figure 5). U.S. corn export share was slightly lower in 1979-80, possibly due to the U.S. drought of 1980. 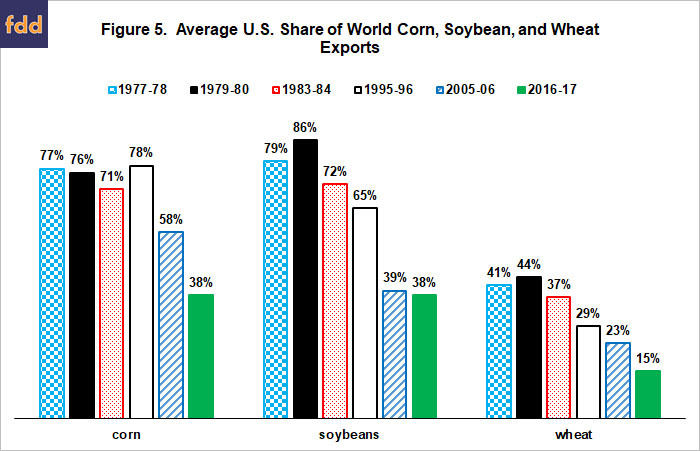 By 1983-84, U.S. share was lower than even in 1977-78 for all 3 crops. Other than for corn in 1995-96, U.S. share is lower for all pairs of years since. The USDA, ERS report of November 1986 concluded that, while international trade was rearranged, the embargos and moratoria had limited impact on the quantity of U.S. exports in the short run. While acknowledging the difficulty in assessing long-term impacts, it attributed most of the decline in U.S. exports that followed the 1980 USSR grain embargo to the increase in the value of the U.S. dollar and a slowing of world economic growth. In addition, already high loan rates were raised for corn and wheat in the wake of the 1980 USSR grain embargo. As a result, U.S. policy provided an umbrella for the rest of the world to expand production. This umbrella remained in place until the 1985 farm bill substantially reduced loan rates. Clearly, all these factors would negatively impact U.S. exports. 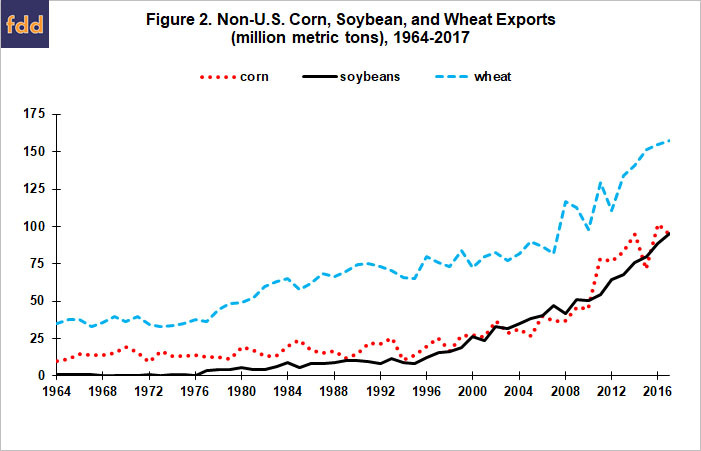 However, given (1) U.S. exports of corn and wheat have never exceeded early 1980 levels despite long term world economic growth, large fluctuations in the value of the U.S. dollar, and the dramatic U.S. farm policy changes in 1985; (2) U.S. share of world exports for all 3 crops has continued to decline; and (3) nearly 40 instead of 5 years have passed; it is reasonable to ask whether the long term impact of the embargos and moratoria of the 1970s/1980s was more than this study suggests? This article calls into question the certainty, but does rule out the possibility, of the common assumption that President Trump’s trade policy will reduce U.S. ag exports in the short run. Main drivers of the quantity of exports in the short run are supply availability across importers and exporters and recent demand growth. Exports can be shuffled. As long as China continues to buy farm commodities, the main impact on the quantity of exports in the short run may be a rearrangement of their destination (see Good for a recent discussion of this phenomena). More troubling is the potential long-term impact. It is difficult, if not impossible, to sort out the long-term damage of the grain embargos and moratoria of the 1970s/1980s, but it is not unreasonable to argue that countries are wary of food being used as a political or economic weapon. The U.S. is not using food as a weapon in the current trade war but food availability and price is a politically sensitive topic in all countries. Thus, it is not unreasonable to think that U.S. trade actions could impact the thinking of importers when it comes to sourcing food. Moreover, the rearranging of exports is likely (1) to increase prices for U.S. export competitors as traditional importers of U.S. commodities source them elsewhere and (2) reduce U.S. prices to encourage non-traditional importers of U.S. commodities to buy them from the U.S. Higher prices for U.S. export competitors will clearly stimulate their future production. 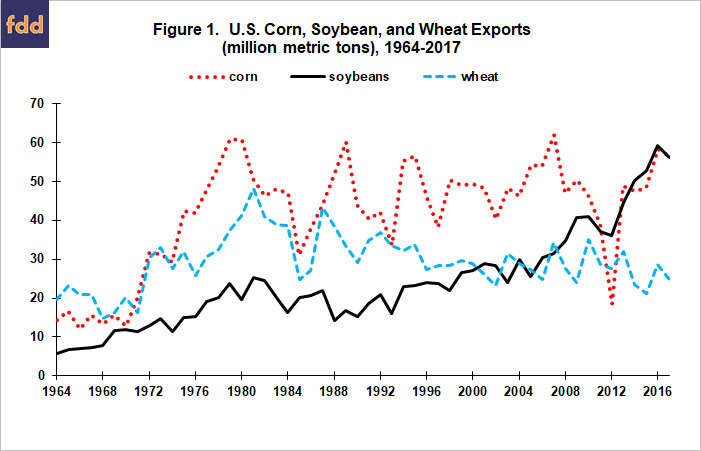 It should be sobering to the U.S. that the quantity of U.S. corn and wheat exports have never really exceeded the levels of the early 1980s, a time span now approaching 40 years. In short, it is the long-term consequences of current U.S. trade policy for U.S. ag exports that bear watching and will likely be the most important ag trade storyline coming out of the current trade war. Good, K. “Looming U.S. - China Trade Battle: Soybean Trade Flows and Substitutes.” Farm Policy News: News Summary. Department of Agricultural and Consumer Economics, University of Illinois at Urbana-Champaign. July 6, 2018. Swanson, K., G. Schnitkey, T. Hubbs, J. Coppess, N. Paulson and C. Zulauf. "Impacts of Chinese Soybean Tariffs on Financial Position of Central Illinois Grain Farms." farmdoc daily (8):68, Department of Agricultural and Consumer Economics, University of Illinois at Urbana-Champaign, April 17, 2018. U.S. Department of Agriculture, Economic Research Service. “Embargos, Surplus Disposal, and U.S. Agriculture: A Summary.” Agriculture Information Bulletin Number 503. November 1986.